Presidential candidate Bernie Sanders, who has been vocal on the campaign trail about the scourge of big money in politics, said on Sunday he would push legislation in Congress to provide public funding of elections. 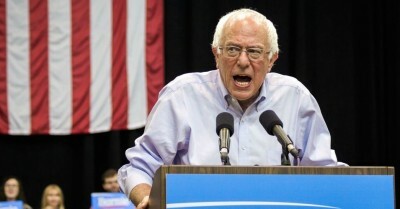 “We’re going to introduce legislation which will allow people to run for office without having to beg money from the wealthy and the powerful,” Sanders told a crowd of about 300 people at a town meeting in Rollinsford, New Hampshire. In his own presidential campaign, Sanders has eschewed support from super PACs, which the Citizens United ruling spawned. Instead, Sanders has relied overwhelmingly on small donations from individual contributors. Altogether, more than 76.5 percent of all contributions—totaling more than $10.5 million—came from individuals who donated less than $200. Meanwhile, as The Intercept reported Monday, Sanders’ chief rival, frontrunner Hillary Clinton, has been more vague and less inspiring when it comes to the matter of big money in politics. It’s all well and good for Clinton to state her support for publicly funded elections, Schwarz argued—but she has yet to walk the walk. It’s always better to have big-time politicians say the right thing than not. And Clinton may in her heart “believe” in publicly financed elections. But Lance Armstrong may also truly “believe” in clean, no-doping professional cycling. And just as Armstrong did what he felt he had to to win, Clinton has declined to participate in the presidential public financing system, because it places limits on how much candidates can spend. She did not take the available matching funds in her 2008 primary campaign. Nor is there any indication she will for the 2016 primaries or (assuming she’s the Democratic nominee) the presidential campaign. It’s defensible for her not to want to unilaterally disarm for the 2016 general election, since the public financing system would limit her campaign’s total spending to only $100 million. (Romney spent almost $500 million in 2012, even without counting outside spending, and the 2016 Republican candidate will surely spend far more.) It was perhaps legitimate for her to opt out for the 2008 primaries, since Obama did as well. But Clinton could participate in the public financing system in the 2016 primaries versus Bernie Sanders et al. She won’t. Clinton has yet to do so.